The Turbo Wobble Bottle Catnip Cat Toy is a fun interactive cat toy that dispenses catnip while playing! 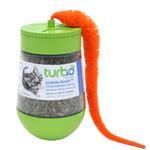 The Turbo Wobble Bottle Catnip Cat Toy engages and rewards cats for interactive play! 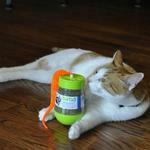 It features a bright orange plus tail that cats will immediately gain interest in. Its unpredictable movements engage cats as they wobble, bobble, and spin the toy to get their high quality North American catnip reward. 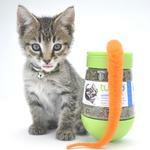 It can also be used to shake or pour catnip on toys and scratchers to entice play. Small holes release the catnip scent for endless cat fun! Love that the wool sweaters are Fair Trade and organic.